Brand Blackberry has taken quite a beating in recent times with sales of smartphones from other brands rapidly eating into the market share of Canadian company Research in Motion. So a social media campaign like this is just what the brand doctor ordered! Launched strategically on Independence Day, the ‘India Action Challenge’ invites Indians to make a pledge – it could be personal or for a community cause and then take action to turn the pledge to reality. 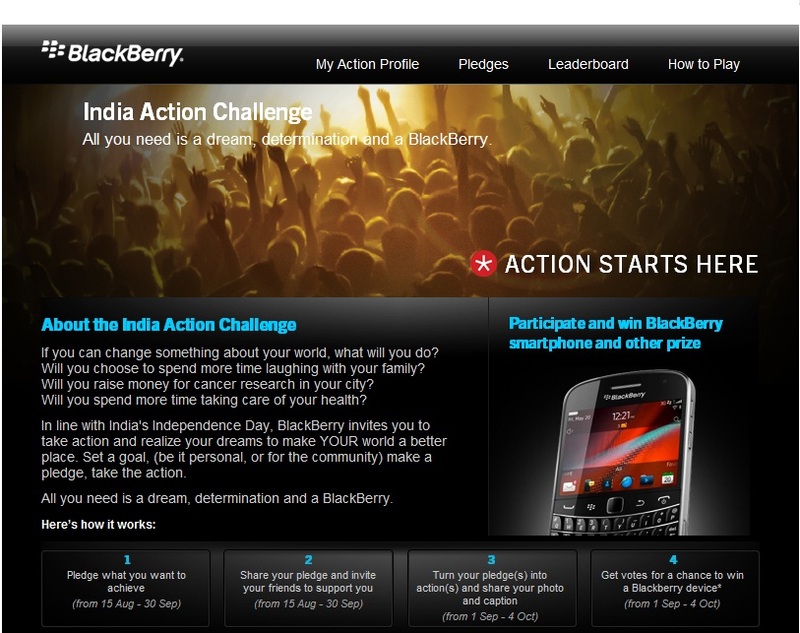 By dangling a Blackberry device as the prize, the brand aims to associate itself with the achievement of dreams and social causes. The campaign is divided into four parts and the first two legs have already reached a conclusion. First, participants had to pledge what they wanted to achieve, share the pledge and invite support from friends between 15th August and 1st September. The next leg of the competition involves turning this pledge to reality and sharing a photo with a caption by 4th of October. 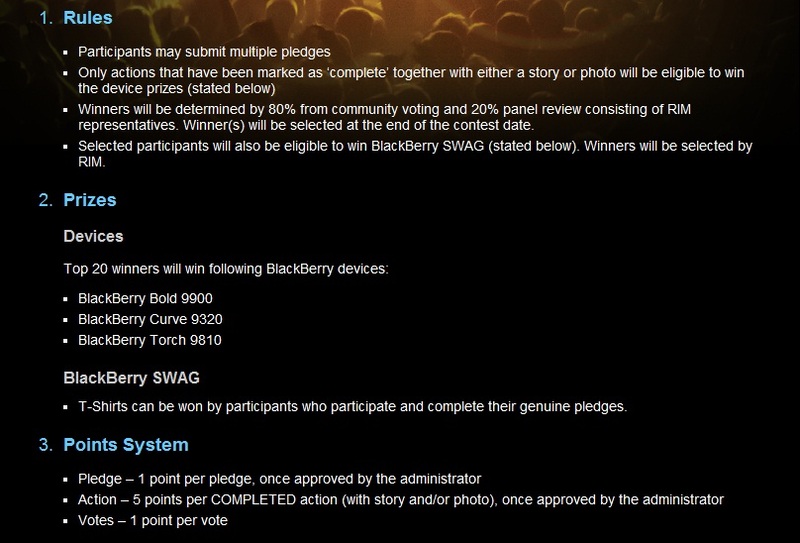 Fans from all over will then vote for their favourite photographs and the winners get a Blackberry device. According to the campaign page on Facebook, 3% of pledges have already been completed. 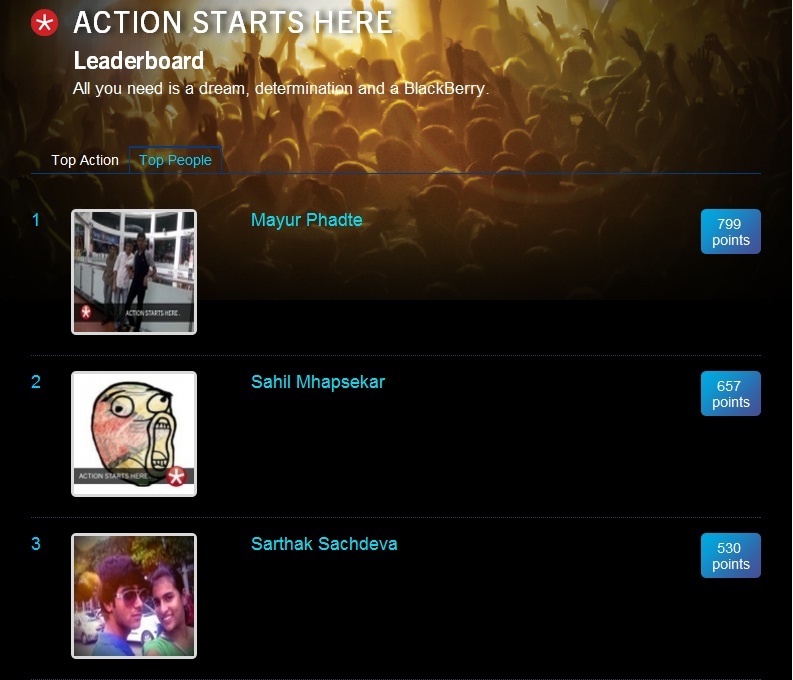 The campaign is quite competitive with most popular pledges and people listed on the leaderboard on the Facebook page. Participants are allowed to make more than one pledge, which helps them acquire more points and votes. You can enter your pledge in categories like travel, friendship, love, work, social cause or if it doesn’t fit into any of these, the ‘other’ option is always open. Winners stand to win Blackberry phones or T-shirts. That’s a pretty good incentive to participate! This is a pretty long campaign as far as social media-driven campaigns go and the response has been more than encouraging. Pledges made by participants range on personal subjects like love and friendship to larger causes like sports, travel and work. 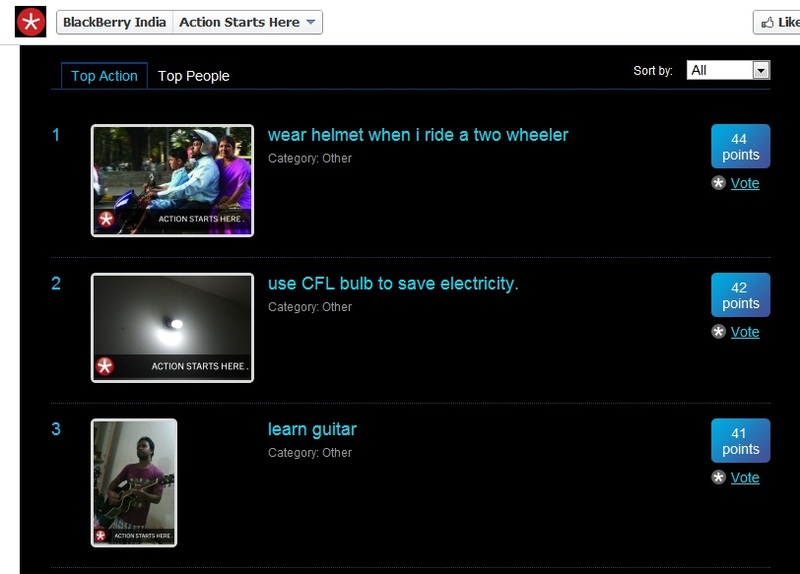 Among the top 50 pledges are environment-friendly ones like ‘Use mobiles and tablets instead of papers for reading books to save paper and trees’ to random ones like ‘Visit Nainital Lake once again in my life’. The best part about the campaign is that even if you’re not involved enough to make a pledge yourself, you can always be a part of the whole process by voting for your favourite ones. It remains to be seen what the brand has planned for the campaign finale. Going by the whopping amount of points people have collected, this campaign has definitely piqued people’s fancy! It figures that Blackberry did not want to restrict users with regards to the subject of their pledges but it doesn’t escape notice that the nature of pledges are all over the spectrum. Some of them strike me as downright frivolous while others have real merit as potential social campaigns. 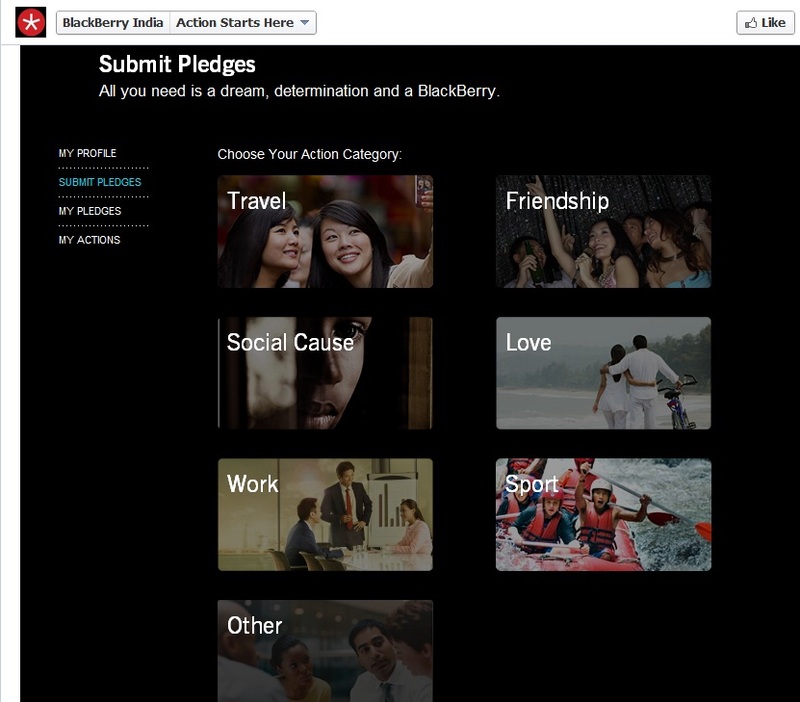 Clubbing categories like ‘friendship’ and ‘work’ with ‘social causes’ makes the campaign appear a little confused. The ‘other’ category is a whole different story! All the user has to do is get himself clicked at his workstation and his job is done! It would have made much more sense for users to shoot a video clip and then give a short speech about how the pledge changed them. That would have made for some inspirational viewing. The concept is excellent and it has obviously caught the imagination of users. With a little more fine-tuning, it could be a real winner and positively more news-worthy. When Social Samosa Hit the Spot with HubSpot!